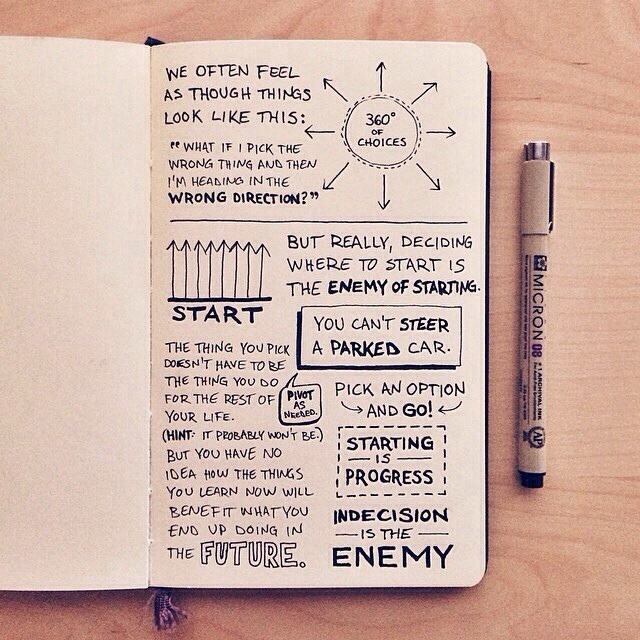 But really, deciding where to start is the enemy of starting. The thing you pick doesn’t have to be the thing you do for the rest of your life. (Hint: it probably won’t be.) But you have no idea how the things you learn now will benefit what you end up doing in the future. You can’t steer a parked car. Pivot as needed. Pick an option and go! Starting is progress. Indecision is the enemy. — I’d love to know who wrote this. If you know the source please drop me a line and clue me in. Previous Post How Often Should I Give Feedback? This was hand drawn by sean wes. I share your thoughts exactly.